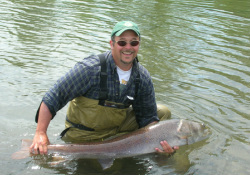 David Gilroy is studying the ecology and management of Hucho taimen. David graduated in 2001 with a B.S. in Biology from the University of New Mexico. In addition to his undergraduate research experience in New Mexico's Middle Rio Grande region, he has been involved with ecological research and cultural exchange in Central Asia, Southeastern Siberia and Mongolia since 1996. He served as a field assistant on a fisheries and toxicology project in the Selenge River Delta in the summer of 2000. The following summer he helped coordinate a Tahoe-Baikal Institute project investigating the impacts of placer gold mining on water quality in Mongolia's Selenge Watershed. He returned to Mongolia in September of 2003 to assist in a project determining the impacts of current gold mining practices on fish populations in the Yeroo watershed. David also worked on projects researching food web dynamics and native fish restoration in the Lake Tahoe Basin of California and Nevada. Clyde Goulden is an ecologist studying the impacts of climate change on nomadic herders in Mongolia. Clyde is also interested in water problems in China. He has been working in Asia for almost 20 years, spending most of the summers each year performing research and training young Mongolian scientists. Clyde is the director of the Asia Center and the Institute for Mongolian Biodiversity and Ecological Studies (IMBES). Kyle Hartman joined the MAAERI research team in 2011 and participated in stream side research on the Eg-Uur River in September 2012. He is now the Associate Director of Academics and a Professor at the Division of Forestry and Natural Resources at West Virginia University. Kyle is working with U.S. and Mongolian scientists and students on the bioenergetics and thermal performance of Mongolian salmonids. Experiments are planned to complete the data necessary to develop bioenergetics models for taimen, lennok, and grayling. Such models will be linked to other ongoing projects to understand the ecology of these species and to understand how climate change may affect these species. Zeb Hogan earned an undergraduate degree in ecology and evolutionary biology from the University of Arizona. He later became a visiting Fulbright scholar ar the Environmental Risk Assessment Program at Thailand’s Chiang Mai University. Returning to the United States, Hogan completed his Ph.D. in ecology at the University of California, Davis. Zeb also served as a WWF senior freshwater fellow, and was named a National Geographic Emerging Explorer in 2004. He is now an associate research professor at the University of Nevada, Reno. In all, Zeb has 12 years of experience in fisheries research and conservation, including three years in North America, one year in Africa (Botswana), one year in Europe (France), and seven years in Asia. He is also spearheading the Megafishes project. Tom Hrabik has been studying Mongolian lakes and rivers since 2005 when he first joined the Mongolia Taimen Project's research team at the Eg-Uur River. He is now an Associate Professor in the department of Biology at the University of Minnesota, Duluth Campus. Tom has been a co-investigator on several MAAERI research projects and currently has two graduate students involved in both lake and river research in Mongolia. His research focus is fish ecology, limnology and fish population dynamics. Olaf Jensen has been studying Mongolian lakes and rivers since 2007 when he first joined the Mongolia Taimen Project's research team at the Eg-Uur River. He is an Associate Professor in the Department of Marine & Coastal Sciences at Rutgers University. Olaf is the principal investigator on several MAAERI research projects and leads teams of U.S. and Mongolian scientists and students on field expeditions to the Eg-Uur River and Lake Hovsgol. His research focus is fish ecology and fish population dynamics. Dr. Mead is currently an Assistant Scientist of the Patrick Center for Environmental Research (PCER) of the Academy of Natural Sciences. He leads the Watershed and System’s Ecology section of PCER. He worked at the University of Pennsylvania as a Post-Doctoral Research Fellow in the Department of Earth and Environmental Sciences. His doctoral advisor was Charles Hall, SUNY ESF. Mead’s Ph.D. research was combining literature values and field studies to develop the first spatial model of energy flow through the foodweb of a temperate stream. His research section uses Odum’s “systems ecology approach” to study the development, dynamics, and disruption of ecosystems. He is currently on the Society for Freshwater Sciences Science and Policy group, and was past president of the Wildlife Societies working group for the Stready State Economy. Often, Mead’s team studies ecosystems by combining simulation modeling with field and laboratory studies. Ultimately, their research section develops tools and knowledge that allows managers to best minimize human impacts on ecosystems. Dr. Mendsaikhan is an ichthyologist at the Institute of Geoecology of the Mongolian Academy of Sciences. She obtained her Ph.D. in 2010 from the Institute of Ecology & Evolution in Moscow. Dr. Mendsaikhan was the principal investigator on the PEER research project studying the impact of climate change on endangered Mongolian salmonid fishes and the project manager for the Lake Hovsgol GEF project from 2004 - 2006. Norman Mercado-Silva is a Research Specialist with the School of Natural Resources, University of Arizona and a Guest Professor at the Department of Ecology and Natural Resources of the Centro Universitario de la Costa Sur (Universidad de Guadalajara). Brian Roth was born and raised in Seattle, Washington, where he grew up fishing. He decided during his undergraduate studies that he wanted to have a career in fisheries, namely fish ecology. His graduate position enabled him to spend the majority of his time in the field, where he learned a great deal about how fish interact with their environment. Modeling offers him the opportunity to explore interactions that are difficult or impossible to explore in the field, thus expanding the range of research questions he can ask—and answer. His research focuses on food web interactions between native and non-native species. Within this context, he often evaluates harvest as a driver of fish population dynamics. Currently, he works on projects involving walleye harvest in northern Michigan and Wisconsin. He also has projects to evaluate the nearshore Great Lakes food web and fish communities, and the influence of diel vertical migration on siscowet lake trout growth and consumption in Lake Superior. Jake Vander Zanden is an associate professor at the Center for Limnology and the Department of Zoology at the University of Wisconsin - Madison. His research interests include aquatic ecology, invasive species, and food webs. Jake is a native of Neenah, WI, and received a Bachelor's degree in Geography (1994) and a Ph.D. in Biology (1999) at McGill University, Montreal, Canada. He was also a David H. Smith Postdoctoral Fellow (The Nature Conservancy) at the University of California Davis. Check out John's blog from our 2011 expedition! Johns's original major research interests are the ecology, evolution, and conservation biology of temperate North American fishes, especially the diadromous forms that migrate between fresh and salt water. Another focal area for John is the stock structure of fishes, in both the theoretical and applied senses. He works collaboratively, mainly using molecular approaches, on species such as Atlantic and shortnose sturgeons, striped bass, and American shad, and will continue active studies on sea lamprey, Atlantic cod, and winter flounder. Additionally, the analysis of otoliths (ear bones) of fishes has become a superb tool in teasing apart their life histories. Other research topics that John has experience with or strong interests in include the systematics of percoid fishes, the zoogeography and diversity of North American fishes, fluctuating asymmetry as an indicator of stress, fish passage restoration, mark-recapture of fishes, the effects of regional warming on biota, the ecological effects of power plants, the natural export of tropical fish to temperate waters, and the literature and art of natural history and angling. Brian Weidel joined the Mongolia research team in 2009 to study fish ecology and food web dynamics in Lake Hovsgol. He is currently a Research Biologist with the Great Lakes Science Center, where he studies Lake Ontario prey fish and lower trophic levels. Brian is a co-investigator on MAAERI projects and collaborates with graduate students at the University of Minnesota, Duluth and Rutgers University studying Lake Hovsgol. Tim Zimmerman has been studying how students learn science during research experiences in Mongolia since 2011. He participated in the 2012 field season research expedition and is a Co-PI on the NSF IRES Mongolia project. Tim is currently an Assistant Professor of Science Education at Rutgers University. His research focuses on how people learn science when they are engaged in out-of-school science experiences and pedagogical techniques to foster science learning in those settings.